Brewery Ommegang is a fantastic craft beer producer out of Cooperstown, NY, which, of course, is also known for being the home of the Major League Baseball Hall of Fame. I usually associate Ommegang with their myriad wonderful Belgian styles, but this beer is a straight-up Imperial IPA. The nose is doughy, with loads of orange and lemon. The middle is predominantly bitter with orange peel and pine resin with sweet and sour citrus coming back in the finish to balance out the bitterness a bit. The body is heavy, and the alcohol is an imperial but not unreasonable 8.8% ABV. The is an excellent exection of the style, and in my opinion will appeal most to those who tend towards the west-coast style IPAs with their overstated bitterness. An outstanding beer. This entry was posted in Reviews and tagged Ale, Brewery Ommegang, DIPA, Imperial IPA, IPA, New York, Ommegang on November 11, 2016 by Xander. 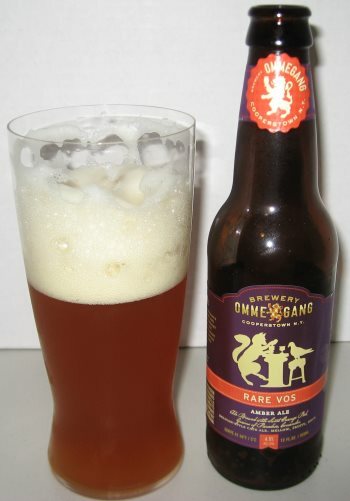 Rare Vos is a Belgian Amber Ale from Brewery Ommegang in Cooperstown, NY. This beer pours with a massive head that has a texture reminiscent of the foam you get with a root beer float. The nose is fruity, with cherries and bananas. The middle is fruity and spicy, with cherries, plums, and pepper. The finish has a bit of orange rind, sweet pears, and coriander. 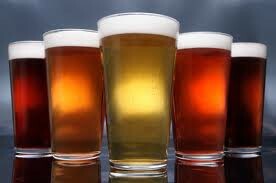 It’s a medium weight beer, delicious and well balanced. The flavors are well defined, but not so powerful that you get tired of them, making this an excellent everyday drink. This entry was posted in Reviews and tagged Amber Ale, Belgian, Belgian Amber Ale, Brewery Ommegang, New York, Ommegang on September 20, 2013 by Xander.